Breakfast or dessert... you choose! As you have seen, I make the majority of the snacks in the house - all sorts of biscotti, cookies, muffins and granola bars. If we won't go through them fast enough, we like to freeze them so we can have them as needed because most items tend to thaw pretty quick. For something a little different, I made individual sweet breads (easy to freeze!) that both of us really enjoyed today. Studded with chocolate chunks and dried fruit, Chocolate-Cherry Breakfast Bread is not too sweet to have in the morning, but would also be nice to have as an after dinner treat. 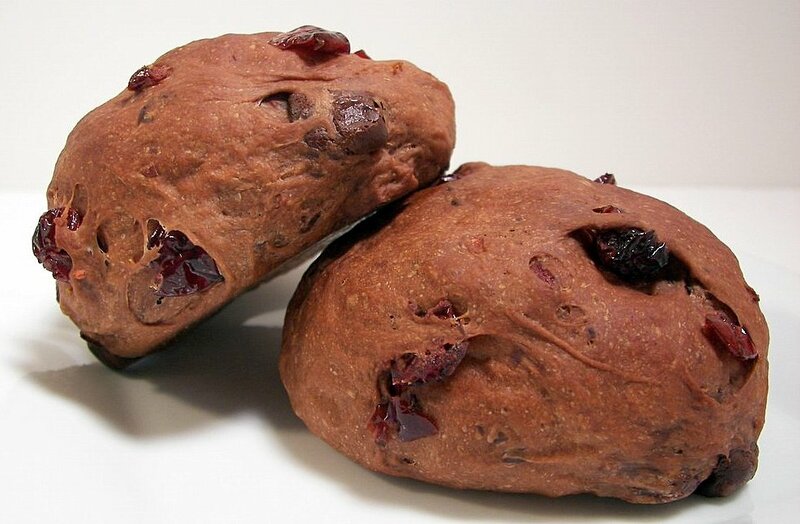 A double shot of chocolate flavor in these chewy rolls comes from cocoa powder in the dough in addition to the chopped bittersweet chunks. In the recipe you may notice there is a variable amount to the flour - how much you use will use depends on the humidity and how you measure out your flour. I would always start start out with the least amount and slowly add enough, a tablespoon or two at a time, until the dough feels tacky. You do want to use enough so that you can knead without it sticking to your hands. If you don't have access to instant yeast, you can always make this with active dry. Just proof the yeast with a pinch of sugar, using the water called for in the recipe, for about 5 or 10 minutes. 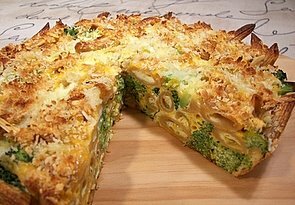 Tonight for dinner, I made a Cheddar, Broccoli and Pasta Bake. To keep down the amount of dishes, I added fresh broccoli into the pasta midway thru the cooking time so I didn't have to do it separately. When you cook the pasta, you don't want to let it go all the way as it will finish cooking in the oven - so drain it a littler earlier than you normally would. While you could add all of the sharp cheddar as you mix the ingredients together, I saved half of it to scatter on top to create a gooey cheesy top. 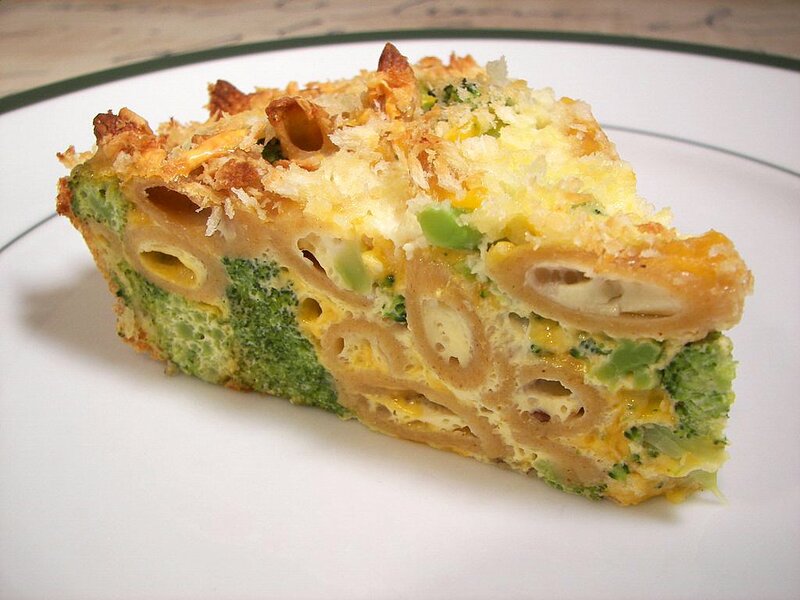 The eggy filling was a nice compliment to the tender broccoli and pasta. The bite from the cayenne pepper sauce was subtle, but it added just enough heat to keep it interesting. Before adding the ingredients into the pie dish, a layer of panko breadcrumbs is added to the pie dish. This adds a crunch to the outside and also allows for easy removal of the pieces. A little more panko, mixed with a touch of olive oil, is also scattered on top for an additional crunch. I think one of my favorite parts was the ends of penne that stuck up out of the pie and got a little crispy! After the brownies yesterday, we thought it be best we kept tonight's dinner leaning more towards the lighter side. To start us off, I made a side of Broccoli, Cranberry, and Apple Slaw. 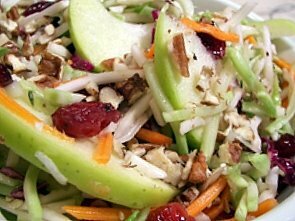 This combination of broccoli slaw (which is a mixture shredded broccoli, cabbage, carrots and cauliflower), sliced granny smith apples, dried cranberries and toasted pecans should be made ahead of time so it has plenty of time to marinate with the dressing. Sweet and tangy, the dressing consists of rice vinegar, sugar, white wine vinegar, olive oil, salt and cracked pepper. With a plethora of vibrant colors, this salad was very fresh and light with a satisfying crunchy texture... we liked this so much I will probably end up making it again before the week is over! For a different and fun twist to tonight's dinner, I also made some Cornmeal-Carrot Skillet Cakes. 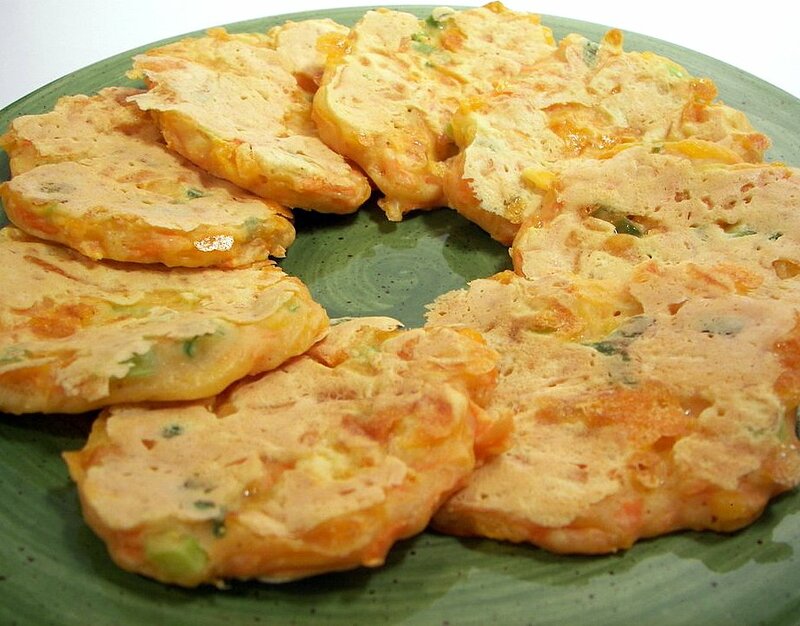 These involve mixing shredded carrots with a savory thick pancake-like batter. Mild green onions, sharp cheddar and cornmeal each bring a unique flavor that marry together very well. As they cook in the skillet, the cheese begins to melt and stays a little gooey in the center, but helps the outside get a nice golden crisp crust. A little puffy, these cheesy little cakes end up being just bigger than silver dollar sized. These are perfect for a quick weeknight meal as they come together in a snap and only take a few minutes per side to cook. When we want something extremely decadent, I would usually turn to our favorite brownie recipe. But since I was going to turn this into a treat for the weekly Wednesday Treat Day for Jeff to bring in tomorrow, I wanted to give a new recipe a go and boy did we ever hit gold. Coworkers... get yourselves ready for a hump-day sugar high! Pure love in the form of chocolate, Thick Mint Brownies made me weep with my eyes rolling backwards as I took a small bite from the fork. You know... quality control. This extremely rich brownie has a vivid hidden layer of filling very much like you would find in a peppermint patty - though a little less minty. 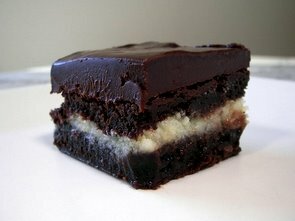 As you slide a fork through the thick luscious chocolate ganache and into the brownie layers, you will find yourself hitting chunks of dark bittersweet chocolate. Each piece is dense and fudgy with an intense chocolate bite. While these could be perfectly fine with no frosting as they have the type of crisp crust on top that would shatter as you slice into them, we just had to gild the lily with a creamy ganache. These cut very clean even though they are not your cakey type of brownies. Not a fan of peppermint? Why not flavor the hidden filling slab with kahlua, rum or maybe even a coconut extract? While I wipe the drool running down my face after thinking about my piece of brownie, I guess we should move on to dinner (although I debated just having another brownie and calling it a night!) 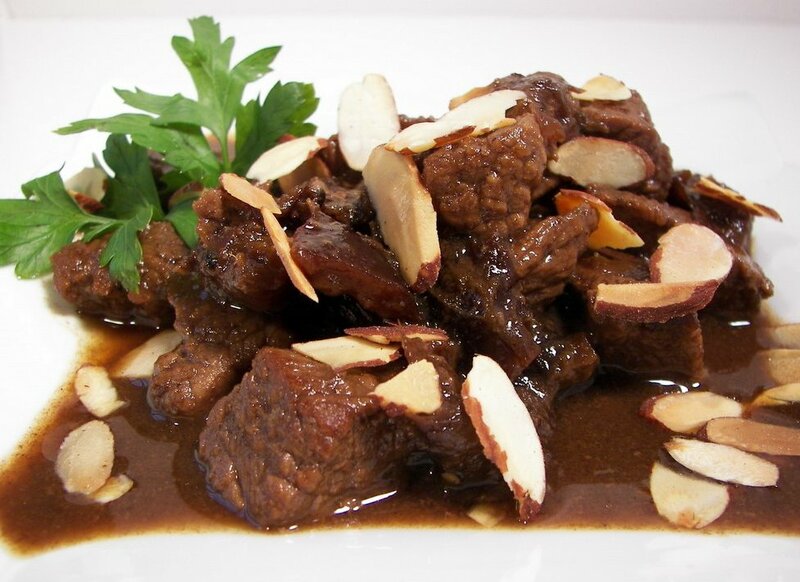 Tonight's dish, Beef Tagine with Dried Plums and Toasted Almonds was a little unusual for us to make. I say that because we don't often have red meat with this kind of spice combination. You start off the dish by making a sweet Moroccan blend of spices called Ras el Hanout. You will be left with some extra which you could use to season other cuts of beef or even salmon. The beef is slowly cooked in a mixture of the spice blend, onions, beef broth and water in the oven until extremely succulent tender. Near the end, dried plums and honey thicken the sauce and bring a sweetness to the meal. Since I've never made something like this, I'm not sure if the sauce was too thin or not - but it worked well for us with a side of flat bread to mop up the flavorful drippings. I may suggest reducing the amount of honey as it was almost too sweet. 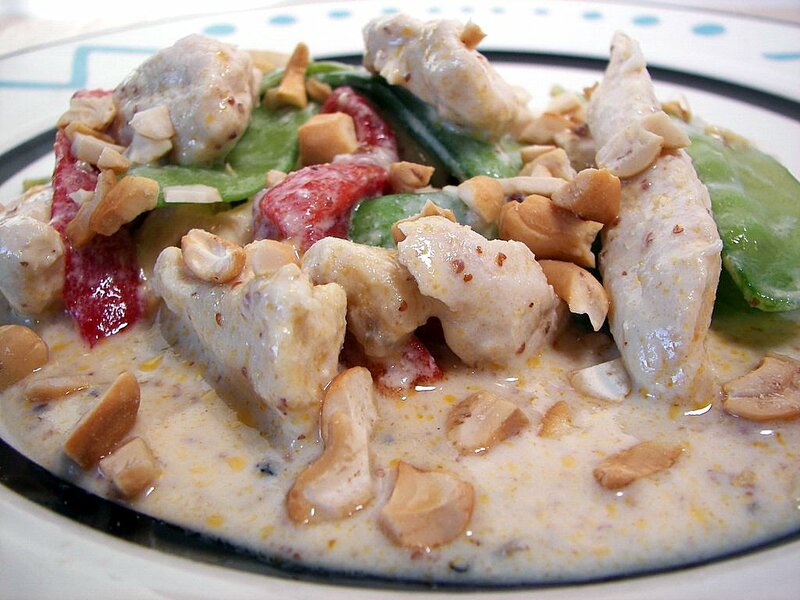 Nutty toasted sliced almonds scattered on top finished the dish with contrasting crunch. We have been pretty dry around here... so much that the grass has that dusty brown hue that we had to live with in Phoenix. Tonight the drops are starting to fall outside, which in turn makes it a perfect night for some soup! Although it was iffy if the soup was going to finish cooking, as it seems the power likes to go out for a couple minutes at a time if there is even weak breeze! Ahh... country life! 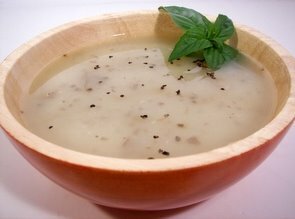 Tonight's dinner, Garlic and Potato Soup, is not a heavy thick potato soup that one might be used to. Caramelized onions form the base flavor with quite a bit of vegetable broth and water to keep it light. Cubes of russet potatoes and a bunch of whole garlic cloves are added in and this mixture is left to simmer until the potatoes are very tender. Since the soup takes about 20 minutes to soften the potatoes, the garlic mellows out and looses its bite. To give the soup some body, I used an immersion blender to puree most of the chunky potatoes and garlic cloves. Try not to puree too much though, as you want some larger bits left behind. You could do this in a blender, but process them in small batches so you can control the texture. Because we like to leave the peels of the potatoes on, the visuals of the soup is not as clean, but I don't see why else you would need to take them off. Light, fairly smooth and darn filling, this comforting soup was a great way to end a humid rainy evening. No oven soon... can we do without? We kept the ball goin' again this week with 11 new recipes. This week's highlights for us were the Braised Carrots, Toasted Coconut Vanilla Marshmallows and we were both surprised with how much we liked the Tempeh Coconut Curry. The recipe sections to the left have been updated - you may need to hit refresh to see the additions. In anticipation of the upcoming kitchen renovation (they are coming out to get the measurements sometime this week!) I have been wondering what we are going to do without the use of a stove and other things we will loose out on until the remodel is done. So, for today's treat, I wanted to make something that did not require an oven and could be played with to change the flavors. Peanut Butter Graham Squares with Dark Chocolate Drizzle are incredibly easy to make and do not require much to put together. I did use a food processor to make graham cracker crumbs and a stand mixer to beat the filling, but you could just as easily crush the crackers with a rolling pin and use a wooden spoon to mix it up. 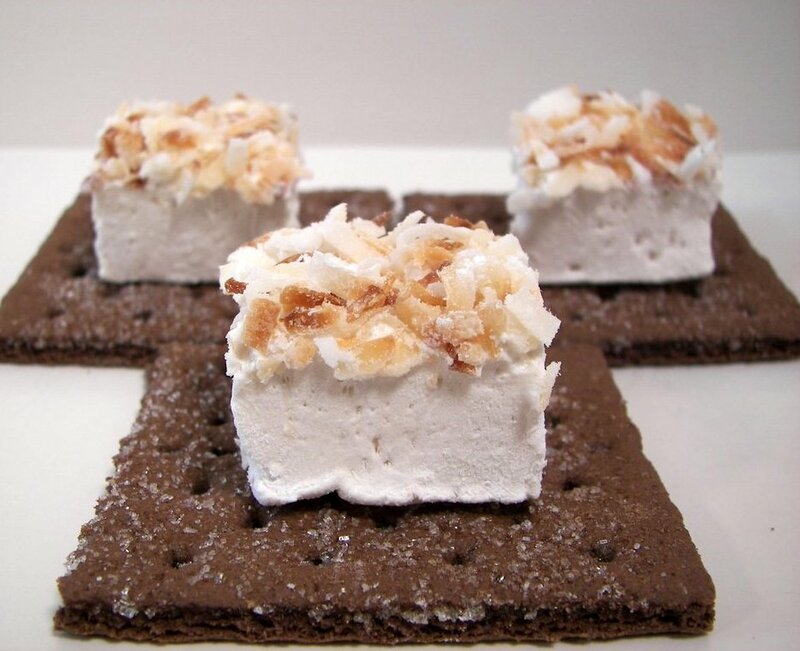 The bottom is just whole graham crackers in a single layer and these remain very crisp even through refrigeration. Packed with peanut butter flavor, the thick layer of filling is made from butter, creamy peanut butter, graham cracker crumbs, confectioners' sugar and a splash of vanilla. I wanted a contrasting top layer, so instead of completely covering it with chocolate, I opted for a drizzle instead. 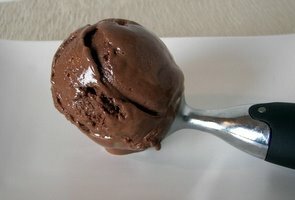 If you wanted a more in-depth chocolate flavor, you could just melt more chocolate and pour it over instead of the drizzle. These bars are very firm if left in the refrigerator, but if you set them out for 15-20 minutes, the crust remains crunchy but the filling turns soften and very creamy. 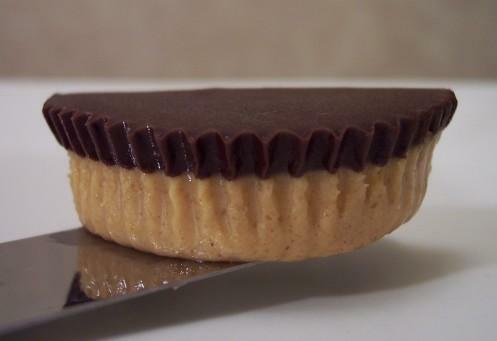 Chocolate graham crackers, crunchy peanut butter or different kinds of melted chocolate are just a couple of suggestions to change around the flavors and keep it relatively simple! Don't be afraid... it's just zucchini! Zucchini in baked goods sometimes weirds people out, usually because you can see the threads inside, but I don't find that you can really taste it. The zucchini helps keep the item very moist and is a good way to use them up when you have an abundance of them laying around. Grated zucchini portioned out into the amount needed for a recipe freezes well and tends to thaw pretty quick. 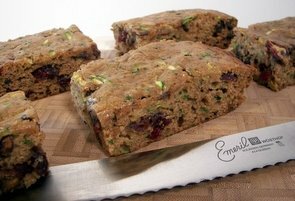 I wanted to make a snack cake today and have had this recipe, Spiced Zucchini Bars with Cranberries and Pecans, in my to-try pile for quite a while. We decided we waited way too long to make this after we had our first piece. The tender cake is so moist with a rich caramel-esque sweetness from dark brown sugar. Cinnamon and allspice bring a light spicy flavor which was a great accent to the dried cranberries. The nutty flavor really came through even though there are not a ton of pecans - but dont skimp on toasting them first, they might get lost without that boost in flavor. I also like how visible the bright green strips are weaved throughout each piece. Often times I find myself in the kitchen prepping a meal that some people would consider a side, and serving it as a main dish by just increasing the portion size a bit. We have had quite a few tasty and filling dinners this way and tonight's gratin was no exception! This creamy Potato-Gorgonzola Gratin has a more adult flavor to it coming from the choice of cheeses used. 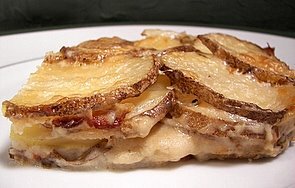 Thin slices of russet potatoes (I usually leave the skin on even if the recipe requests it to be peeled) are layered with a robust sauce made from plain soymilk (or milk if you prefer) thickened with a roux made from butter and flour. Pungent gorgonzola rounds out the body of the sauce with a creamy texture while fresh thyme adds a mild earthy flavor. As the sauce bubbles away making for tender potatoes, a golden crust with a sharp bite starts to form on top from fresh grated Parmigiano-Reggiano cheese. If you want a less pungent sauce, use a good melting cheese like fontina to keep the creaminess going. Since this takes a bit of time to cook, I hastened the prep time of the potatoes by using a food processor to make even 1/8" slices. 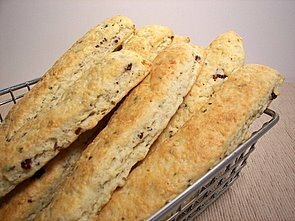 While these where baking, I threw together one of our favorite biscuit recipes and put them in the oven as soon as potatoes were done. By the time they were baked and golden, the gratin had cooled enough for us to cut and serve so we had fresh pipping hot biscuits to have along side. I love to bake items that are one or two bite treats as they are great for keeping portion size in line and they are just fun to eat. I was going to make some small cookies today, but I happened upon a recipe I stashed away for something I was going to test out for Christmas treats this year. Orange-Walnut Tassies are small golden cups filled with a sweet and rich filling with a subtle orange tang. The cups are a tender cream cheese dough that are formed in mini muffin tins. The dough is soft and very easy to work with - I didn't even need to flour my fingers to keep them from sticking as I was pressing the pieces into shape. The crunch in the filling comes from a bottom layer of chopped toasted walnuts. The sweet filling is made from brown sugar, brown rice syrup, orange zest, fresh orange juice and an egg. As these bake, the egg makes the filling puff up almost like a muffin - but as they cool, it slowly settles back into a lush dense blend of textures. I thought the best bites were the ones where a little of the filling oozed out and down the sides of the crust making a sticky caramel-like coating. 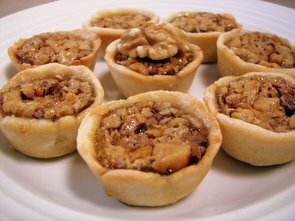 Jeff commented that it kind of reminded him of an individual pecan-type pie, execpt made with walnuts. 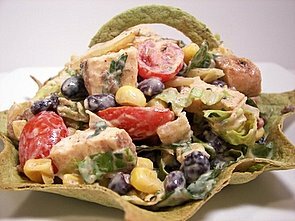 Even though we have been eating a lot of veggie-only (no reason really, just how it happened to be planned out) dishes lately, tonight's dinner, Chipotle Chicken Taco Salad, changes things up with a spicy kick. The thick creamy dressing has a smoky bite from cumin and chili powder, but also takes your mouth for a ride with heat coming from chipotles in adobo. The salad is a mixture of crunchy romaine, spiced chunks of chicken, fresh cherry tomatoes, creamy avocado pieces, black beans and fresh corn that I sauteed in a bit of butter. As I read through the recipe, I kept thinking it was lacking a hard crunch somewhere, so I formed and toasted a flavored tortilla in a fun shape for something different. Light, refreshing and between the chicken and beans, we both found this to be very filling. It certainly reminded us of life back in Phoenix! I should preface tonight's dinner post by saying that I have never really made something like this (well, we did have something kind of like it before) so I'm not entirely sure if it came out as intended - I think it did though! We both looked at each other trying to figure out who was going to try it first... but Jeff took the first bite and the look he gave made me quickly dive in with my fork to find out for myself! 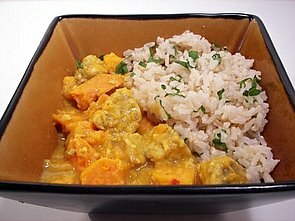 There is an interesting combination of ingredients and flavors in tonight's dish of Tempeh Coconut Curry. We were surprised by the tangy and sour flavor the new-to-us addition of tamarind paste gave to the dish. The spices used include fresh ginger, garlic, ground coriander with the rich gold color coming from turmeric. Crushed red pepper adds a bang of heat (reduce the amount if you don't like a lot of heat - this is spicy!!) while a whole cinnamon stick infuses a subtle sweetness. Water, coconut milk, cubed sweet potatoes and chunky bits of three-grain tempeh are then mixed in and left to simmer until the potatoes soften. 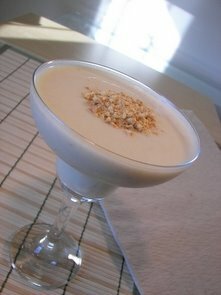 The coconut milk thickens slightly and brings a cool creamy texture to the liquid left behind. Refreshed by lime juice and salty soy sauce at the end, I served the thick curry with a side of brown jasmine rice to help soak up the extra sauce. I will mention that I found the tempeh to be a little on the bitter side - this is only the second time we have ever used it, so next time I will try and either steam it a bit first or bake/grill it for a few minutes to reduce that. I'm very happy we gave this dish a try even though it would have been something we would not normally make! Hmm... our tastes here are certainly expanding and we like it! Who needs Jet-Puffed when you can make your own.. and flavored! For this weeks goodie Jeff will bring for Wednesday Treat Day, I wanted to do something a little different and unexpected to surprise his co-workers. A couple things came to mind, but I couldn't pin down one recipe I really wanted to make. So after sorting through the sweets-to-try piles, I put together something that I think fit the bill. 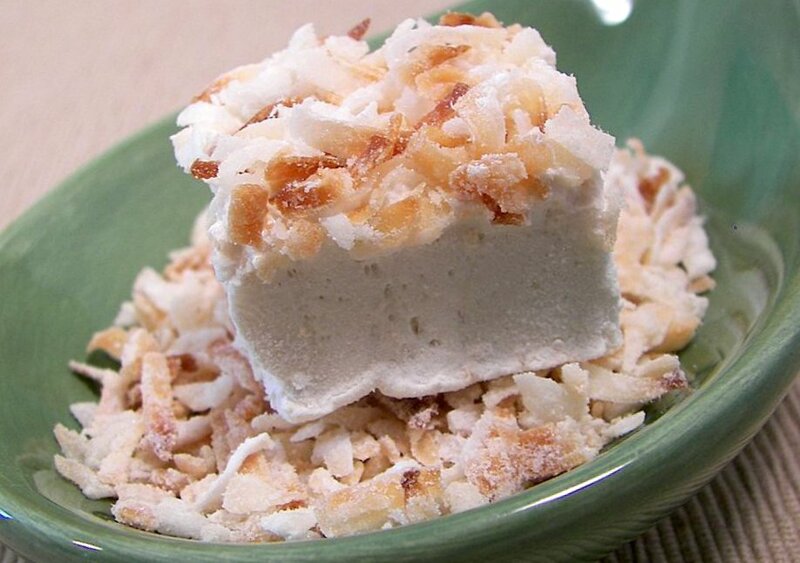 I had a lot of fun making these Toasted Coconut Vanilla Marshmallows. Although, it did put the poor Kitchen Aid mixer through quite a workout - hopefully it will forgive me! The texture of these are soft, light and squishy which was a striking contrast to the toasted crunchy topping. I would have loved to use some vanilla beans or even vanilla bean paste, but I have not seen any good looking beans in a store here- I might have to just go ahead and place an order on-line for some paste. I did use some brown rice syrup instead of 1 full cup of light corn syrup and found it to be a decent replacement - I didn't want to waste a whole batch though if it would not have worked. These ache for a dip in dark chocolate, but I wanted to keep them somewhat plain. Pairing them with chocolate graham crackers would work quite well too! Some tips - while you could use a hand mixer, it would be tricky to pour in the very hot sugar mixture and I'm sure it would get old just standing there for 15 minutes. I would probably not make these without a stand mixer. When you add the vanilla extract at the end, turn the mixer down a few notches. When you pour it in, the thick mixture expands for a second and could make for a big mess. Don't be shy with the confectioners' sugar - it keeps everything from sticking and you can always brush off any extra. I started out using a bench scraper to cut through the marshmallows, but I found a hot (dry) sharp knife squished them less and went through the coconut better. Tonight for dinner I made Vegetable Fried Rice. We have only ever made and eaten fried rice once before and I have been wanting to make it again ever since then. 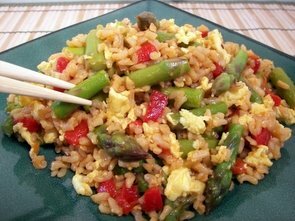 Tender crisp asparagus combined with roasted sweet red bell peppers, scallions, garlic and fresh ginger anxiously await the additions of brown rice, rice vinegar and soy sauce in a blazing hot pan. In the first fried rice we tried, the eggs are scrambled with the rice mixture. But here, once the salty liquid has been absorbed, you add soft scrambled eggs that you cooked before you start the asparagus. I'm not sure if that made any difference, but it seemed easier to just scramble them at the end with the rest of the mixture. For a fiery finish, the mixture is spiked with a couple glugs of cayenne pepper sauce and a splash of toasted sesame oil to heighten the flavors. Blandness got you down? Add some spice to your life! The best deal about tonight's dinner is that both recipes can be completely made ahead of time and served cold or warmed up. Now, if I would have planned things a little better, I would have made them ahead of time. Making both at the same time was a little more hectic than I was thinking it would be, but it all worked out in the end. To start out, I made Braised Carrots for the side tonight. Taking about 50 minutes to slowly cook, these carrots are melt in your mouth tender - just as if they were sitting around cooking in a dish like pot roast. The flavors were so intense and pronounced - the sweetness from the carrots with the bright tangy juice from the lemons was perfect. Smashed chunky garlic, fresh from the vine tomatoes and chopped mint brought an amazing depth of fresh flavor. I also liked the addition of fennel seeds - I don't use them often, but the slight licorice taste was a pleasant surprise. I was not sure if the end texture would be too mushy for Jeff, but he made sure to tell me how much he liked these and that I can't have them for lunch tomorrow... hmph! 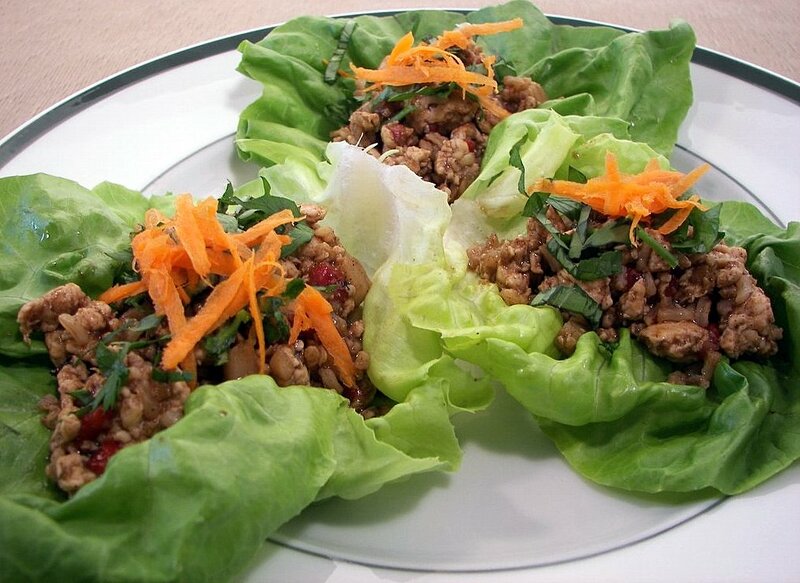 Five-Spice Turkey and Lettuce Wraps was the main portion of our meal. To give the turkey breast a head start with a boost of flavor, it is cooked with fresh ginger in some sesame oil rather than a canola or olive oil. Once the turkey is browned, cooked brown rice, roasted bell peppers, crisp water chestnuts, broth, hoisin sauce and five-spice powder* are all mixed in. After this juicy combination is thoroughly heated though, it is placed in individual leaves of tender boston lettuce. 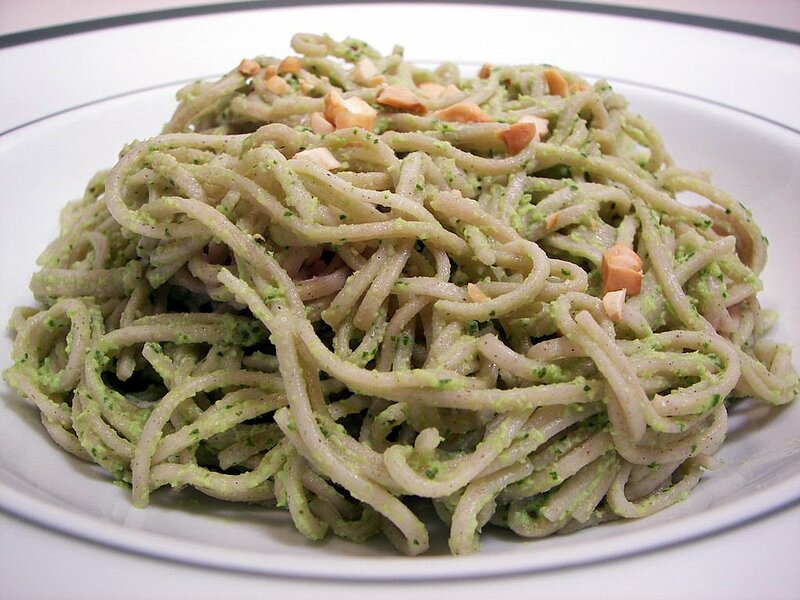 Cilantro, fresh basil and mint are scattered on top and then a sprinkle of shredded carrots finish these off. Savory and a little sweet, these were on the table in under 30 minutes and rolling them into wraps make them fun to eat too! *Five-spice powder incorporates 5 basic flavors in one mix - sweet, sour, bitter, pungent, and salty. I used Penzeys and their blend consists of cassia cinnamon, star anise, anise, ginger and cloves. Some blends will also include szechuan peppercorns which would be even better. We did eleven new recipes this week and we tried a few new combinations of food! Our favorites would be the Nutty Breakfast Bars, Chocolate Chocolate-Chip Cookies with Mocha Cream Filling, and Chicken, Spinach, Brown and Wild Rice Salad with Sauteed Apples. I also brought both of the recipe sections up-to-date today - you may need to hit refresh on those pages to see the additions! The sum of the ingredients for tonight's dinner are not new to us, but the cooking method and flavors that developed are. While we normally cook rice on top of the stove, the one pot dish recipe for Indian Chickpea Rice Casserole shows us just how easy rice can be made in the oven! No muss, no fuss and the rice came out with a perfect light texture. Because the mustard seeds are first toasted until they pop, they release a more nutty flavor, rather than any heat. The bite from freshly minced ginger with a hint of sweetness from the currants was a nice contrast to the fairly mild dish. Topped off with a scattering of cilantro and chunky bits of cashews, Jeff and I both thought this whole dish tasted a little unusual, but surprisingly good and I believe it should be considered vegan to boot! We were out of muffins this morning, so I decided to go a different route and make some biscotti to have on hand for snacking. 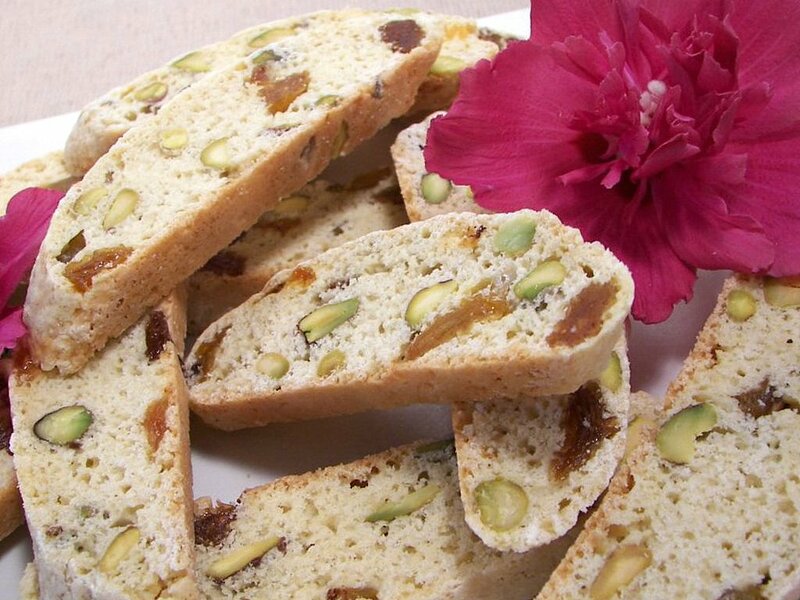 In our recipe section we have quite a few biscotti recipes we've done before, but they are so versatile that you can pretty much flavor them to your preference. Today we went with the recipe, Pistachio Raisin Biscotti. These are more crunchy and the kind that would be perfect for dunking as there is no butter or oil in them. Inside the pale golden biscuits are vibrant green specs of Pistachios and plump chewy raisins. I thought they were sweet enough as is, so we opted to keep them plain instead of dipping or dizzling them with chocolate. I think maybe some lemon zest would be a fun addition to heighten the flavors some. I normally like to cut biscotti while they are still pretty warm, but these baked loaves cut cleaner without any pieces crumbling off after I let them cool for about 20 minutes. I have been wanting to do a few granola-type bar recipes so we could have some on hand for quick snacks rather than buying them. I wanted the bars to have a lot of flavor, be filling and use pantry ingredients we normally keep in stock so we can make them whenever needed. Thick, dense, chewy, quite filling and a little sweet, these Nutty Breakfast Bars are the ones we have been enjoying the most. To bring out their nutty flavor, sliced almonds, pecans and sunflower seeds are first toasted while you prepare the rest of the ingredients. 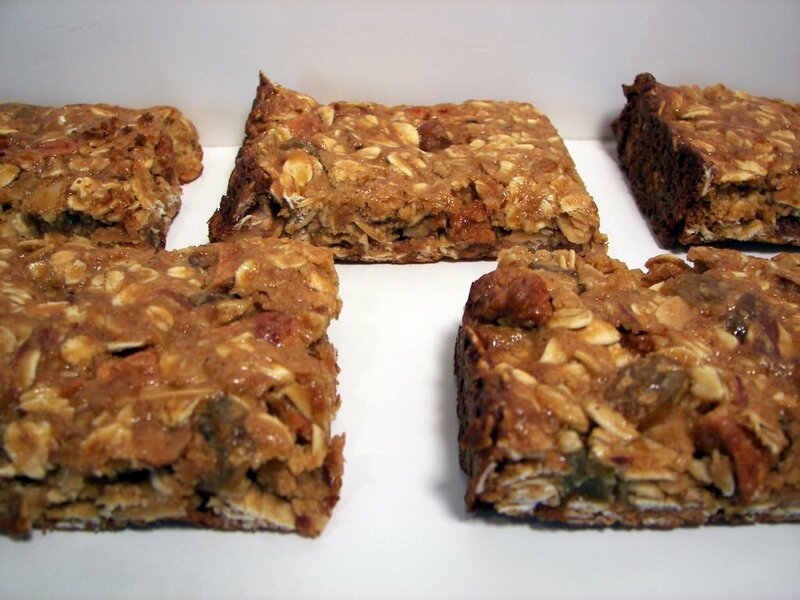 To add to the nutrition of the bars, the bulk of the ingredients are rolled oats, soy flour (I used full-fat), dry milk and toasted wheat germ. Cinnamon spiced dried apples and plump golden raisins add to the chewiness. 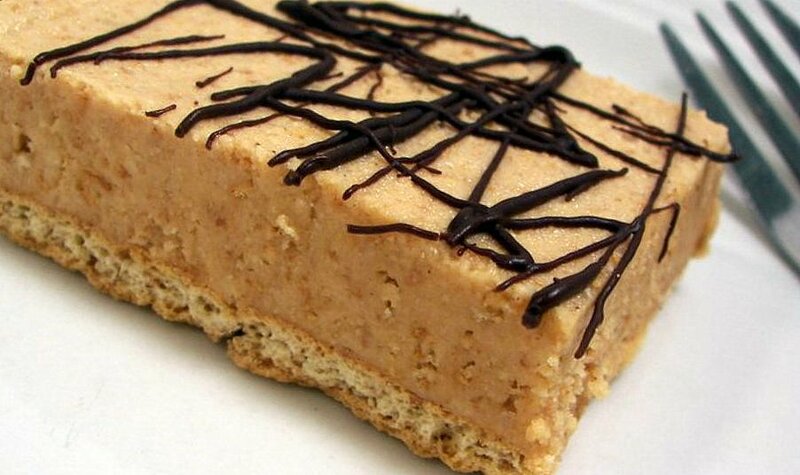 The binder for these bars is a heated mixture of fresh ground peanut butter (I grind my own every couple of weeks, but I would use natural style if you don't want it make it yourself), brown rice syrup and pure maple syrup. Brown rice syrup can sometimes be hard to find (and expensive), so you could use honey or an even better choice would be golden syrup. This mixture is pretty sticky, so when you press it into the pan, either wet your hands or place some plastic wrap on top to keep from making a mess. Jeff's first comment was "Since they are so healthy, why not drizzle some melted dark chocolate on top to make them seem at least a little naughty..." So, his wish is my command! 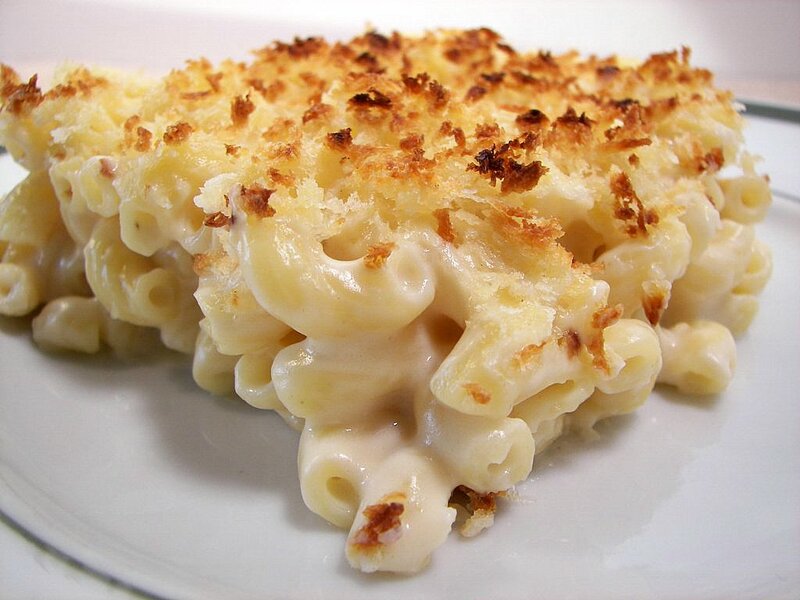 Tonight's dinner, Creamy Three Cheese Macaroni, jumped up the ladder to become one of our new favorite ways to make Mac 'n Cheese. White cheddar, Parmesan and ricotta are the three cheeses we used. 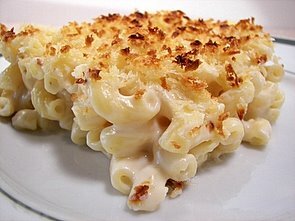 The silky thick sauce that coats the tender macaroni is made from butter, flour, dry mustard and soymilk with dollops of the cheesy mixture stirred in to melt. Freshly grated nutmeg is also stirred in, but don't be afraid to use it. While you probably would not be able to pick it out, it adds such a depth of flavor that works well here. Before being popped under the broiler, crisp panko bread crumbs are laced with melted better and scattered on top to create a rich golden crust. As you have noticed, we have been trying to incorporate tofu into our dinner every so often. I would like to get into using it more often in sweets, but we used it again in a savory dish for dinner tonight. The recipe, Peanut-Crusted Tofu Triangles, does have some prep time to it since you need to drain and press the tofu to remove most of the liquid. To give the crust something to adhear to, the tofu goes for a quick swim in some egg whites. The triangles then get dipped into a mixture of fresh ground peanuts, garlic, ginger and crushed red pepper. Cooked in peanut oil until they are golden and crisp, the tofu has a mild peanutty flavor with a spicy kick to it. I would probably have to do something a little different if I were to make this again though. Even with the robust flavor in the crust, it was still a bit bland - maybe coating both sides instead of one would fix that? Or even better, letting the tofu sit in a mild marinate to soak up some more flavor first. Though I really did like the peanuts, I would probably use cashews next time for a little more bang. To help speed up the rice part of the recipe, we used instant brown rice for the first time tonight. I've always just given into the lengthy time to cook brown rice, but since the recipe requested instant, I gave it a go. The rice was a bit richer and a little more creamy than we are used to as it was cooked in soymilk instead of water. The speedy cook time was nice and while we were plesantly surprised at the texture from the instant version, I think I like being able to control the texture with the regular brown rice. I wouldn't hesitate to use it again though when I need something quick! Recipes you can do ahead make for a quick dinner! We have made breadsticks before and while they were very good, it does take some time to make them as you need to deal with yeast and waiting for dough to rise. But what about when you want something quick and right now? Why not just make a biscuit type dough and then form them into sticks instead? That's what we did when I needed a quick-to-make side for dinner tonight. These Parmesan Bacon Biscuit Sticks have an Italian flare from the seasonings that are used. The dough is flavored with Parmesan, oregano, basil and garlic. Using very cold butter makes blending easy and results in extremely flaky sticks. Salty crisp bacon is crumbled and added into the dough when you add the milk for another depth of flavor. As you add the milk, leave some behind as you might not need all of it. 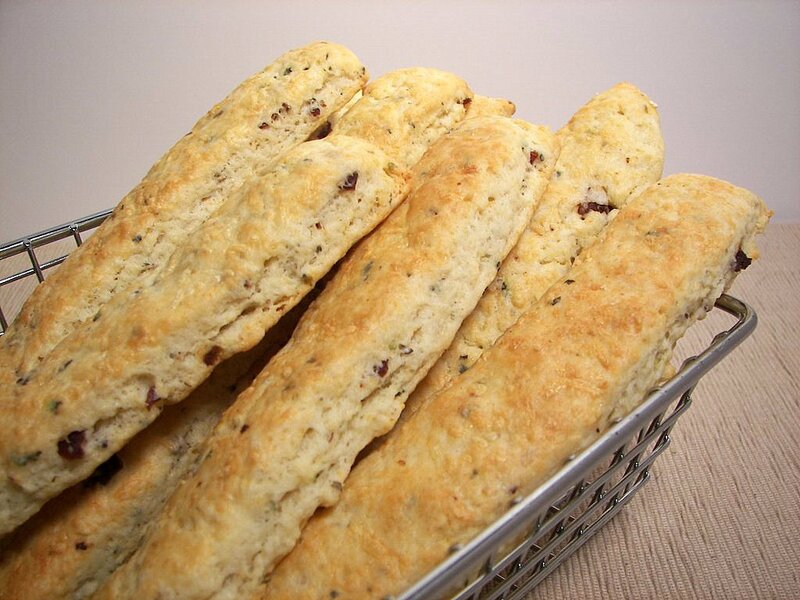 When mixing and rolling, try to handle the dough as little as possible to help keep the biscuits nice and tender. Once the dough is cut into sticks, a quick brush of milk and a shower of Parmesan tops the biscuits and gives them a rich golden color as they bake. The biscuit sticks went well as a side to tonight's dinner, Spinach-Quinoa Salad with Cherries and Almonds. Ever since we tried quinoa for the first time, I'm always keeping my eye out for recipes using it. This salad was light, but very filling with generous amounts of all ingredients. 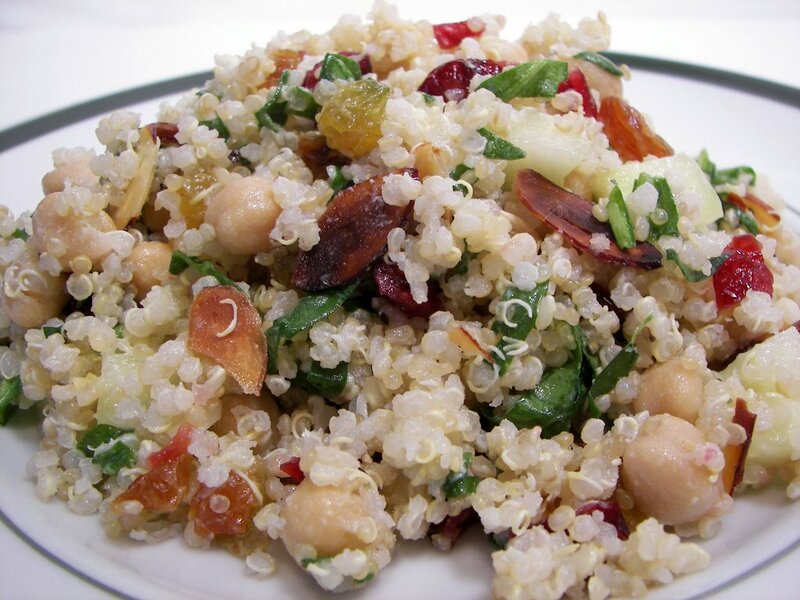 Combined with the cooked spiral shaped quinoa are ample amounts of toasted almonds, dried cherries, chickpeas, chiffonades of spinach, refreshing chunks of cucumbers and onions. The salad is then dressed with a fresh and zesty dressing made from plain yogurt, olive oil, lemon juice and minced garlic cloves. 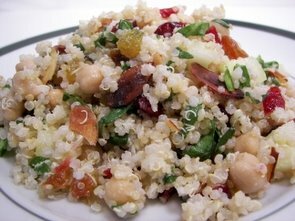 If you don't have quinoa on hand, or can't find it, couscous or bulgur would be a fine substitution. Once nice thing about this dish - it is best when made ahead so the flavors have plenty of time to meld together! I will have to remember this one when we need to bring a dish for a picnic; this would be a great veggie addition! I am trying to get this posted quick as we've been without internet access since last night and it is very touch and go tonight. Once our cable system is back up and running I will get caught up with your e-mails and comments - please don't think we are ignoring you! I did keep myself busy with some baking for the Wednesday Treat Day goodies for Jeff's co-workers though! I think I found my chocolate limit with these cookies, Chocolate Chocolate-Chip Cookies with Mocha Cream Filling. These killer cookies are intense, rich, decadent and may give quite a buzz depending how many you eat! What is sandwiched between the cookies is a soft mousse-like filling that is made from bittersweet chocolate, cream and espresso powder melted together. When cooled, the creamy mixture is combined with butter, powdered sugar and vanilla. The filling was a little tricky for me as I was expecting it to be a little more firm. Depending on how warm your kitchen is, you may need to do the filling in stages as it may go a little too soft. 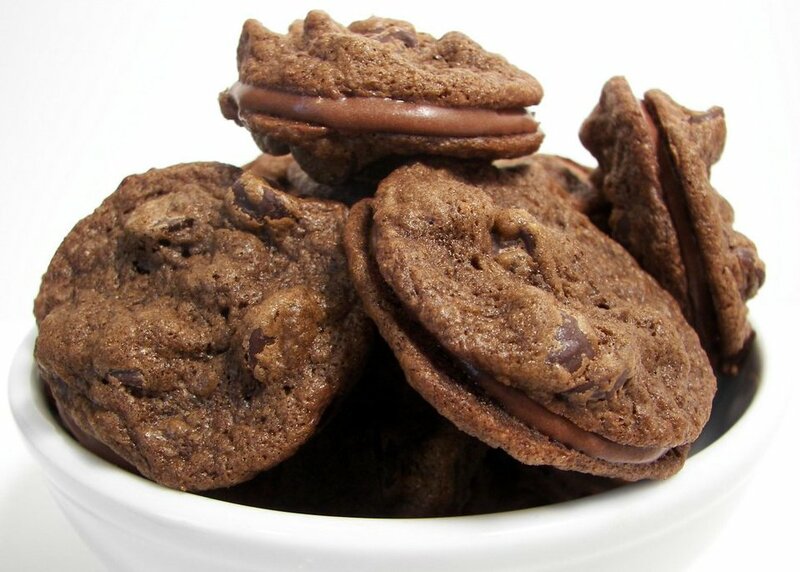 Crammed with chocolate chips, the dark cookies are crisp when completely cool - but once filled, they slowly turn more soft and chewy so when you bite into them the filling does not squish out the sides. To control spreading while the cookies bake, the dough works best when very chilled - so allow some time for that. These will need to be stored in the refrigerator to keep the filling solid, but I found we liked the taste best when chilled. I made just about 60 cookies (pre-sandwiched) because they are so rich, but go wild and make them bigger if you want. Tonight's dinner was a fun new twist on chicken salads for us. 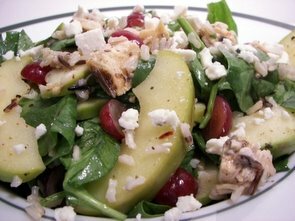 Chicken, Spinach, Brown and Wild Rice Salad with Sauteed Apples had so many flavors and textures happening that it keeps your palate working to figure out the ingredients. 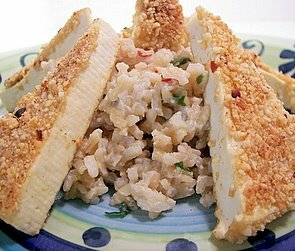 The rice was an interesting and very filling addition to the tart salad. We found there was enough of the bright tangy dressing to go around and keep the salad pretty moist. I sauteed the wedges of granny smith apples for about 3 minutes, just until they softened a bit, but were still crisp. I used spinach in the recipe, but for a more peppery bite, feel free to use arugula. The crumbly gorgonzola brought just enough bite to the salad without competing with the other flavors. We both completely enjoyed this salad and it may just replace our "normal" Saturday night chicken salads! I've only had rice pudding once and it came from one of those little ready-to-eat cups... I was not too impressed. Jeff can be kind of finicky when you start adding what would be considered more savory to sweet items, but he gave the go-ahead and said he would try it since he has never had rice pudding before. 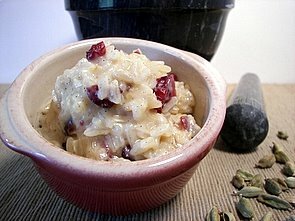 Brown Rice Pudding with Cardamom and Dried Cranberries was pretty fun to throw together since I've never made this kind of pudding myself. Because I used brown jasmine rice, it did take awhile to cook, but I used what we normally have on hand. I don't know if using that changed the texture much from a white rice though. Once the rice is tender, evaporated milk, freshly ground cardamom and honey are mixed in. This bubbles away for a couple of minutes and you end up with a thick, creamy and not too sweet pudding. While still warm, dried cranberries are stirred to enliven the dish with a jeweled color and a bit more sweetness. The chewiness they added was a great combination with the creamy texture. I also like how flecks of the fragrant cardamom stand out against the stark pudding. Jeff, who often finds out he actually likes dishes he would never eat before, gave this two spoons up - I agree! It was a pleasantly cool over the weekend, but the humidity slowly crept up today. 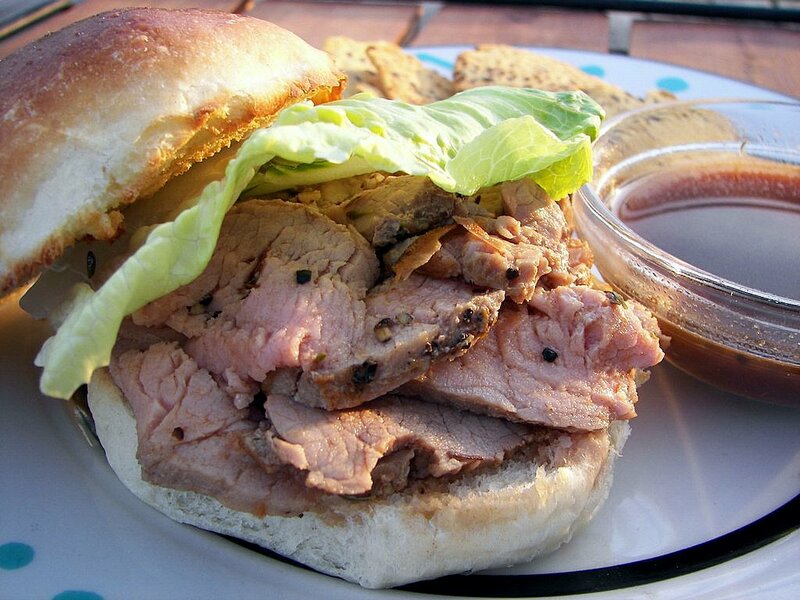 Thinking of the cooler temperatures coming got me in the mood to heat the oven up for tonight's dinner, Roast Pork Sandwiches au Jus with Rosemary. To start this off, pork tenderloin is given a good rub down with cracked black pepper, salt, fresh garlic and rosemary. As this sits, a bit of oil in skillet gets heated so you can caramelize each side of the tenderloin. This is then slipped into the oven to finish cooking until just lightly pink in the center - I like to take it out around 140-145 as it will rise a few degrees as it rests. In the meantime, the browned bits packed full of flavor are scrapped up from the bottom of the skillet with some beef broth. Dry sherry and a bit of tomato paste for richness are added in and allowed to simmer and meld together. The pork is sliced thin, and if you want, add them right into the warm liquid for a few minutes to soak up the flavors before you build your sandwich. I served them over the burger buns I made, toasted of course, but crusty torpedo rolls would be more suited to drink up the intense Jus. As we slide into another week, 13 new recipes came out of the kitchen! I think our favorites were the Mini Fruit and Sunflower Loaves, Hamburger Buns and Sweet Pea Risotto with Corn Broth. I can't believe we are already in the middle of August... where has the year gone?! Tonight's dinner, Edamame Lo Mein, was a satisfying and clean tasting meal with a bit of spice to it. We've only had a version of Lo Mein while eating out, but it was pretty heavy and kind of oily. This was much lighter and pretty easy to throw together while using up some pantry ingredients. The salty sweet dressing subdued the heat to a mild level and the toasted sesame oil added a complex background. We both commented that we liked how the pasta gained some crispy spots to it as it cooked with the peppers, edamame and carrots. 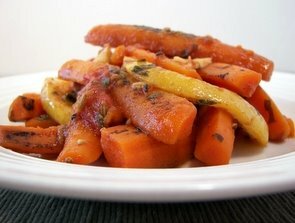 I used roasted bell peppers, but use fresh and add them with the carrots if you want them a bit more crunchy. On Monday, I mentioned that one of our new neighbors stopped by to welcome us to the neighborhood and brought us some fresh from the garden vegetables. As a thank you, I went sifting through the recipe piles looking for something mini sized that would be nice to wrap up and take over. I opted for the recipe, Mini Fruit and Sunflower Loaves, as I had everything on hand and it gave me a reason to use my mini loaf pans that don't get enough attention! 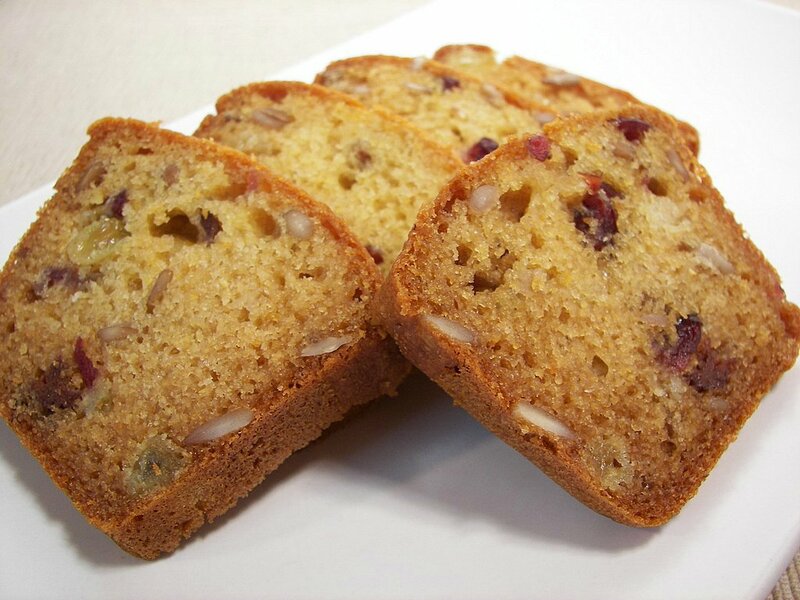 Cornmeal adds an interesting slightly crunchy texture to the bread that is studded with three kinds of dried fruit - golden raisins, cranberries and cherries. 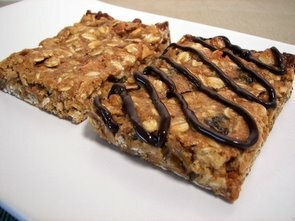 We used sunflower seeds in the recipe, but I think a fun variation would be to use peptias instead. Each caramel colored loaf is very moist with a slightly sweet and flowery flavor coming from orange blossom honey. Maple syrup also adds to the gentle sweetness which is enhanced by a hint of orange from fresh grated orange zest. To make rotating them halfway through a little easier, I placed the small pans on a heavy duty baking sheet before going into the oven. Another busy Friday as we needed to get the lawn mowed... I am still so used to our small postage sized lawn that we had in Phoenix. The dogs are sure enjoying the room to spread out - now we just need to get to work and get a fence going so we don't have to take them out back on a leash! We have made quite a few different sweets with Figs, but I have been wanting to use them in a savory dish for dinner. I bought a bunch during our last haul to Trader Joe's, so now I had no excuse not to try some new recipes out! 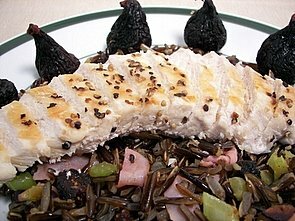 Figs added a dynamic layer of sweetness to tonight's dinner, Chicken Breasts with Wild Rice-and-Fig Pilaf. If you used a pre-cooked wild rice, or planned ahead, this meal could be on the table in no time! I went ahead and spent the full 45 minutes cooking the rice though, as I wanted to infuse it with flavor from the chicken broth. After the onions and fresh celery are softend in melted butter, the cooked rice, rich thin prosciutto and seasonings are all mixed together. Between the nutty rice, salty prosciutto and sweet figs, the pilaf is simply topped with sliced grilled chicken breasts that are seasoned with just salt and coarse black pepper to let the flavors shine through. I have been making the same burger bun for the past couple of years now and while we really enjoy them, I thought it was about time we tried something a bit different. I have been quite happy with the other recipe, but unless you try something new, you may miss something you like even more! 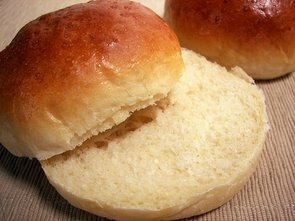 In this recipe for Hamburger Buns, I used all-purpose flour to start instead of using part whole-wheat since it was the first time making them. The dough was soft, supple and very easy to work with. Once it rose and I shaped them into balls, I flattened them a little so they would have a head start with a nice round shape for the second rise. 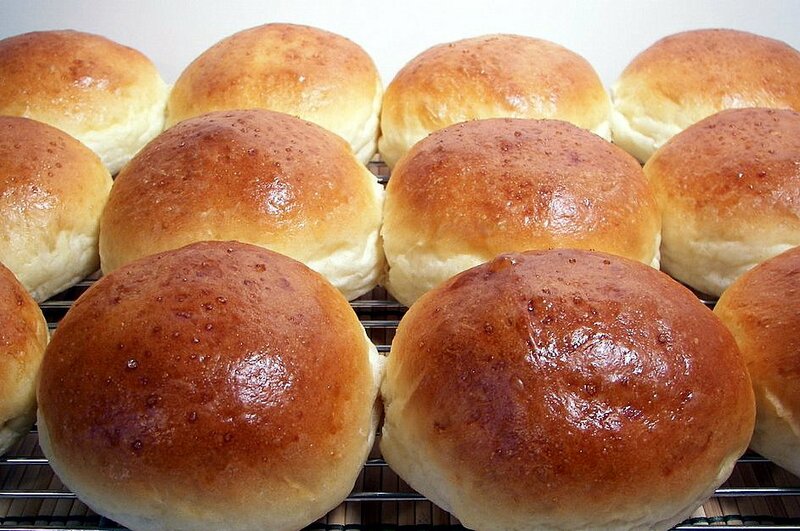 Before they went into the hot oven, a quick brushing of an egg wash makes these pale doughballs turn into glistening golden buns as they baked. If you like, before you set them in the oven, a scattering of sesame seeds would be quite acceptable for these. They are light and fluffy on the inside with a decent crust on the outside. Using milk, instead of all water, makes these very tender as well. While I need to make a batch of the other ones for a proper side-by-side taste test, these ones are certinaly in the running to replace them! Just a note about the yeast - I use instant yeast that I buy in bulk so I don't bother with activing it, but you can easily adapt the recipe if you need to proof your yeast. Mix the yeast with the warm water instead of adding the water to the milk. Add in a teaspoon or so of the sugar and let sit until it gets bubbly - usually 5-10 minutes. You can then just mix this with the lukewarm milk mixture and continue on. The list of ingredients for tonight's veggie-packed dinner, Sweet Pea Risotto with Corn Broth, is pretty long and may look a little daunting. Don't let that fool you though, the recipe was so worth the time it took to prepare. 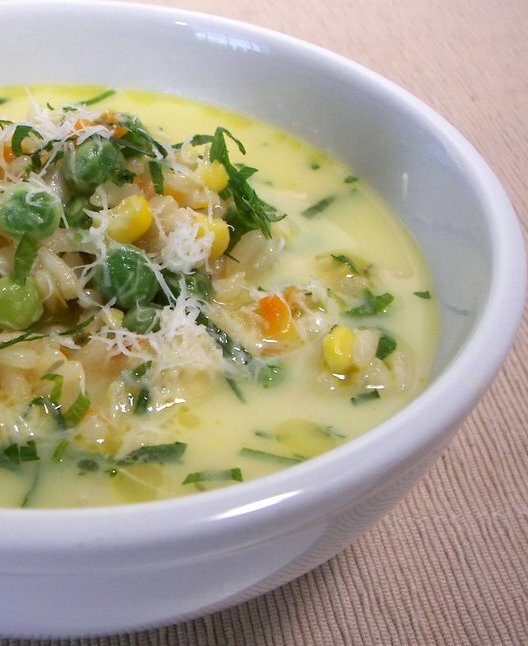 A sweet homemade corn broth surronds a mixture of creamy arborio rice, fresh green peas, sweet corn kernels, crunchy fennel and a dusting of nutty Parmesan for a salty bite. A quick dressing made from sherry vinegar, olive oil, sugar, salt, garlic, a bit more Parmesan cheese, fresh parsley and chives is drizzled over each serving for a snazzy final touch. Jeff and I both thought this was an excellent dish and would be an impressive meal for guests. I do wonder about one thing... while making the corn broth, you strain away any of the corn solids that did not puree. The recipe calls for discarding the leftover solids, but I saved them instead of tossing them. Any ideas what they could be used for? Maybe thrown into some cornbread, a soup or ? Cinnamon, apples and raisins always remind me of cooler temperatures... the aroma of fall came through a dish I made for dessert tonight. We are looking forward to living where there will be an actual noticeable change in the seasons again. As the Cinnamon Apple Raisin Bread Pudding slowly baked in the oven tonight, the smell had us anxiously eating away at dinner so we could grab a piece for dessert. 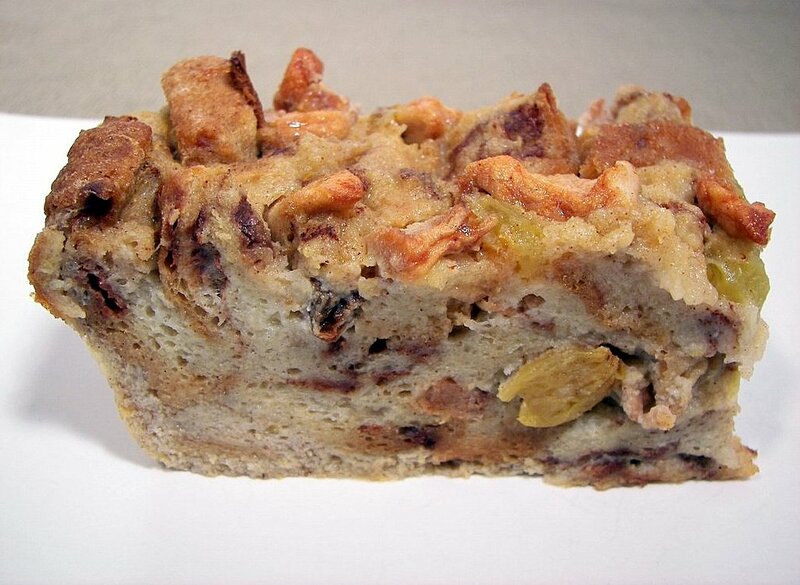 In some bread pudding recipes, the bread needs to soak overnight, but here it only requires a quick 15 minute soak. The mixture it rests in is a combination of lightly sweet vanilla soymilk, sugar, fresh lemon zest, butter, fragrant spices and eggs. Cinnamon spiced dried apples (the soft, not crunchy kind) and golden raisins are also added, but they are first plumped up with apple flavored brandy. It took about an hour to be set in the center, but it may be less/more depending on your oven and what you use to bake it in. We agreed that the flavor was spot on, but the texture was a bit too soft (or as Jeff would say, mushy) for him. I'm not sure if it needs a longer soak time or a little less liquid - maybe if we toasted the cubed bread a bit before we soaked it next time? 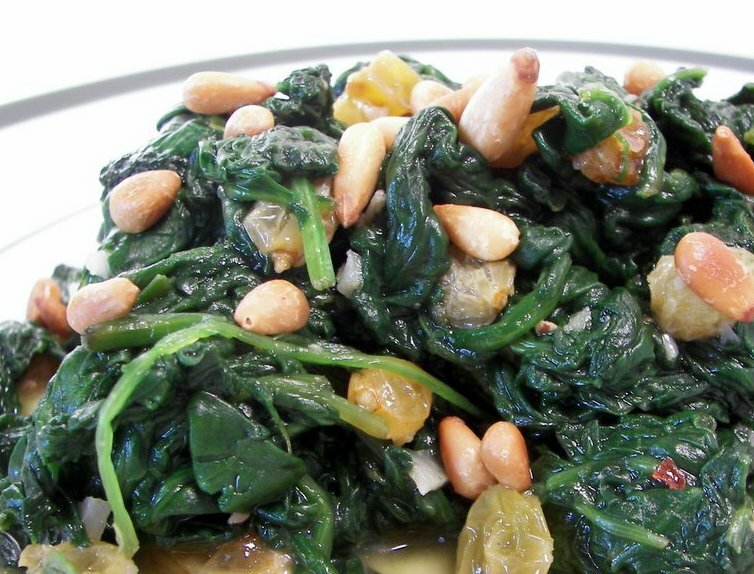 Golden raisins make another appearance tonight in the side dish, Spinach with Pine Nuts and Golden Raisins. 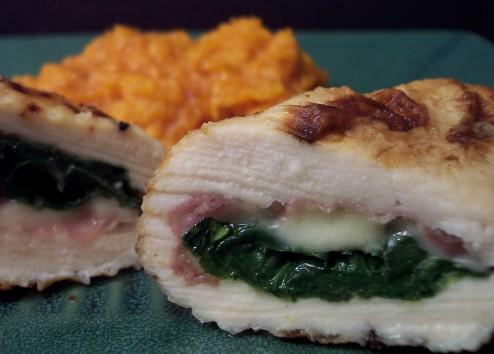 If you like wilted spinach, this is a snap to throw together and was quickly eaten by both of us. Jeff looked at the giant bowl of spinach and said "Who else is coming to dinner to eat all that?!" 3 minutes later I showed him the results and he was pretty surprised it cooked down so much. After garlic quickly cooks in the same pan with a touch of olive oil, the spinach, golden raisins and seasonings are heated through. The juicy raisins were a nice compliment to the sprinkling of rich toasted pine nuts that are added at the end. While the side dish was good, Chicken with Cashews and Vegetables was the highlight of dinner tonight. Sliced chicken breast starts this dish off by a quick cook in some olive oil and garlic. Cashews, red bell peppers and crunchy snow peas are added, followed by some chicken broth. This mixture simmers until the chicken cooks through and the veggies are tender. I would use more red or maybe some orange peppers for color, but I only had half a small red in the refrigerator. Sadly, the store here is too far away to run and get one or two ingredients if I need them. A scrumptious sauce is made with the leftover pan juices, sour cream, grainy Dijon and shot of honey to impart a little sweetness. If I realized that the sauce here would be so generous, I would have served this over some brown rice to soak up the tangy mixture. I'll be sure to make some tomorrow when I have the leftovers for lunch! 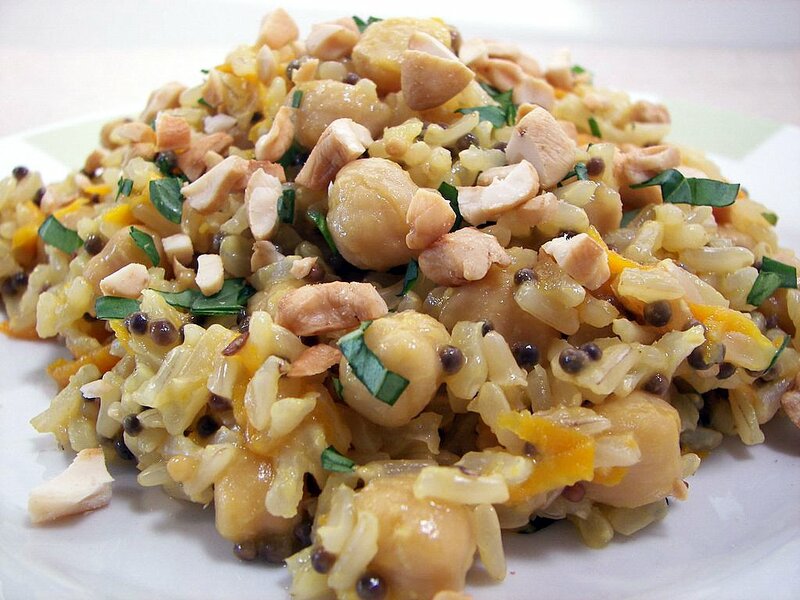 Include the crunchy cashews if you can, the flavor they lend really add to this dish! Yup, Wedesday Treat Day eve is upon us, so I got busy and made a couple new muffins for Jeff to bring into work tomorrow. I like to give options, so no plain jane muffins here! 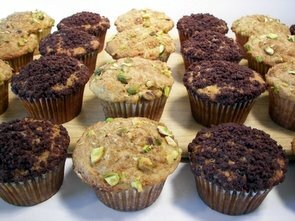 The first muffin has a mouthful of a title - Chocolate Chunk Oatmeal Muffins with Chocolate Streusel. Sweetened with honey, the insides of these muffins are moist, studded with chunks of bittersweet chocolate and have a wicked rich chocolate topping. In the streusel I used raw sugar, instead of granulated, as the crystals are a little larger - this helped bring a bit more crunch to the dark crown. Dutch process cocoa deepens the chocolate flavor with melted butter mixed in to create devilish nuggets of the sweet topping. Buttermilk is used in this muffin which adds some tenderness and rolled oats bring a hearty chew. 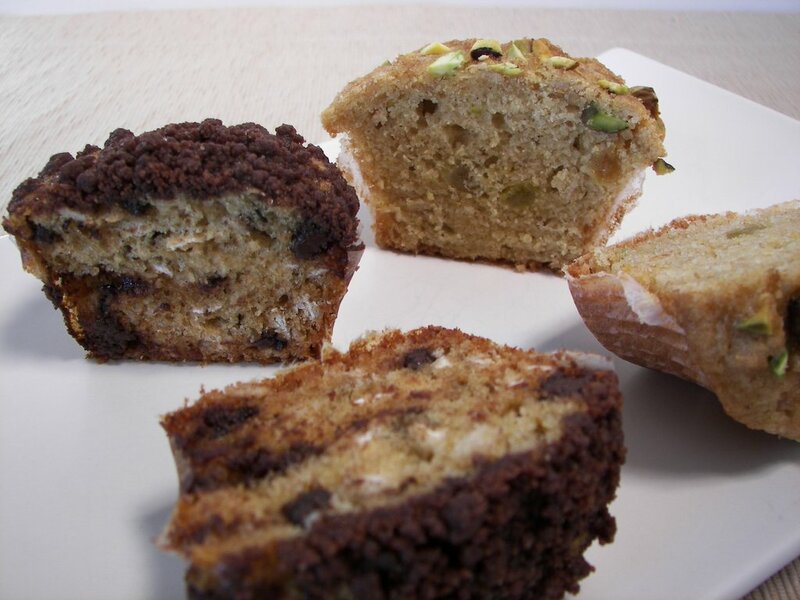 I don't normally like to use muffin liners, as I like the crust the muffins get without them, but I sometimes find muffins that are stuffed with ingredients like chocolate chips tend to stick to the sides more. Though, I do find that it makes them a little more sturdy and helps keep the crown in check as it bubbles up. The second muffin, Pistachio Crunch Muffins, uses one of our favorite nuts. These are sweetened with brown sugar, which brought a rich golden color to the muffins. Crunchy pistachios can be found inside as well as on top here. 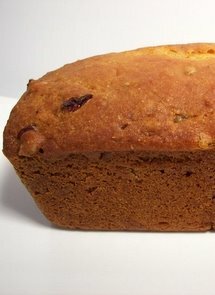 Plump golden raisins and more hearty rolled oats can also be spotted inside. To brighten up the flavor, fresh grated orange zest is added to the caramel colored batter. Applesauce, along with canola oil, keep these extra moist without bringing a heavy flavor... although now I wonder if some mashed banana would have been a better compliment to add another dimension. The sweet topping is just simply a bit of brown sugar mixed with chopped pistachios. For most muffin recipes, I like to start them at 400 degrees - I find the hotter oven gives them better lift and helps form a more round crown. Tonight's dinner has a sauce very reminiscent of pesto, execpt it is made with edamame! 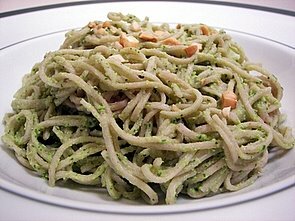 Soba with Herbed Edamame Sauce starts off by processing tender cooked edamame, salty cashews, pecorino Romano, fresh basil, cilantro, zesty lemon juice, olive oil and garlic. This mixture is very thick, so hot water is slowly streamed in to thin it out - the original recipe called for 1 cup, but I used just about 3/4 cup. I looked like it would have been almost soupy with the full amount. The recipe uses chewy Japanese buckwheat noodles called Soba, but if you can't find them, you could substitute whole wheat spaghetti. After the soba noodles are cooked (they cook pretty fast, usually around 3-5 minutes) they are tossed with the flavor packed sauce and a sprinkling of crunchy cashews finishes off the dish. 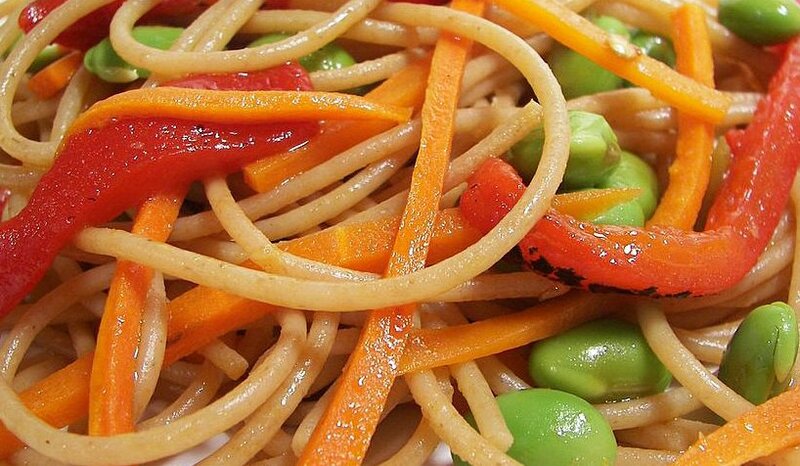 Bright, fresh and a different way to enjoy some noodles! We always have some bananas hangin' around, be it the ones I let go extra ripe so we can freeze them, or ones we eat for morning snacks. We usually have some of the frozen ones in a blueberry smoothie, but I found a new recipe that sounded like a tasty morning snack today. 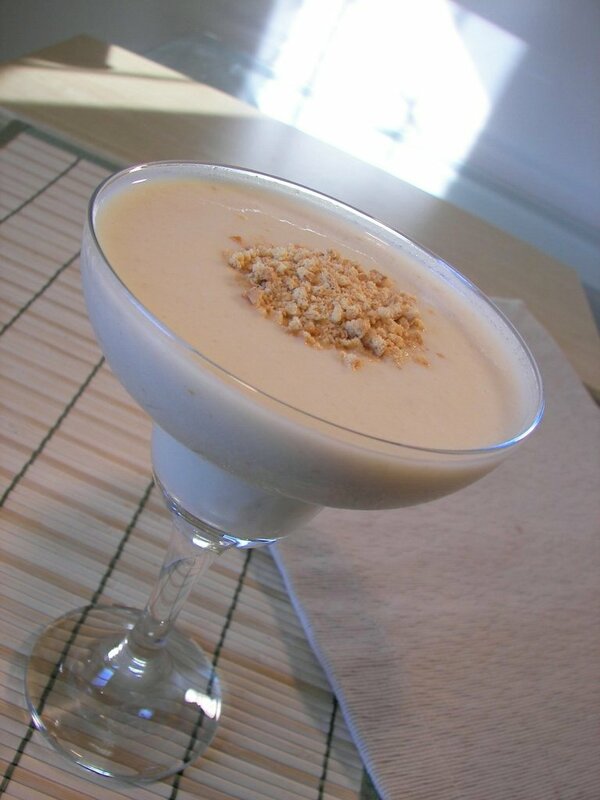 Banana Cream Pie Smoothie is a thick creamy drink topped with a sprinkling of sweet crunchy honey graham cracker crumbs. The frozen ripe banana adds body to this, while some ice cubes help to thicken it. Vanilla yogurt keeps it smooth and while there are some additional graham cracker crumbs added into the mix, they didn't seem to add much flavor. This was a nice alternative from our typical smoothie and since it comes together in a snap, it would be great for a portable quick snack. Tonight's dinner is possibly one of the best sandwiches we have had lately! Mozzarella, Ham, and Basil Panini had so much going for it, you just can't go wrong. 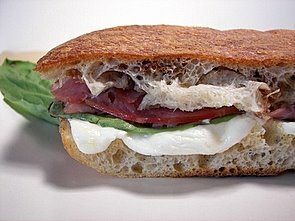 Chewy ciabatta bread is sliced in half, with the bottom being coated with some tangy Dijon mustard and the top with balsamic vinegar. The layering begins with thin slices of fresh delicate mozzarella, large fragrant basil leaves, deli ham, hot peppers and garden fresh (thanks new neighbor!) tomatoes. Once the top half is placed back on, the heavy loaf went into the panini maker to warm up the insides and crisp up the crunchy ciabatta crust. This sandwich is fresh, cheesy, filling and I think I could could eat this morning, noon and night! The only change I might make would be to substitute the ham with some rich prosciutto. Thanks for all of the suggestions regarding the blog's name - I think we are just going to keep the url the same, but go with the idea that was thrown around in this post of adding "Country" to the banner and crossing out "Desert". When we were in Phoenix, we used to be able to get a chicken breakfast sausage at Trader Joe's that Jeff really liked having for weekday breakfasts. Since moving here, we noticed that the closest TJs (30-40 minutes away...) does not carry it and the local stores didn't have anything he liked. I figured we should be able to make something ourselves and we finally found something he really enjoyed. The original recipe for Chicken Breakfast Sausage used ground turkey, but we switched that out with chicken I ground in the food processor. By doing this myself, I can control the texture, so they don't turn out pasty. 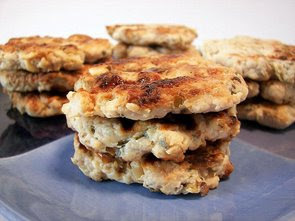 I used shredded Fuji apples which brought a bit of sweetness and helped to keep to these tender patties moist. To add a savory compliment to the sweetness, garlic, fresh thyme and fresh sage are mixed in. When you form these into patties, you will need to wet your fingers as they tend to get a little sticky. I've made these twice now and cook them all at once, then freeze into individual portions that we can quickly heat up in the morning for a fast breakfast. Just a reminder... as always, full views tend to show the best image - you can always click on them to see a larger/clearer view! We are pretty much back to normal in the recipe department - we made 13 new recipes this week! I'm still trying, however, to get used to a new routine for our weekly grocery trips on Sundays. We used to get the weekly ads in the mail, but out here, we don't seem to get any for the local stores. We spent a good part of the morning going through them on-line to figure out where we needed to go. Hopefully we can get into a groove soon so it doesn't seem to take so long to get what we need! I have quite a busy week in the kitchen planned with a lot more new recipes... check back to see what we cook up and bake each day! PS... we also officially spotted our first snake since moving out into the country... ack! But, could this mean Snake Breakfast Sausage could be coming soon? Umm... doubt it! We used to make ice cream all the time a few years ago, but we slowly got away from it and would just end up buying some if we wanted it. If I kept the bowl in the freezer I probably would have used it more, but once it was out of sight, I just forgot about it. After we unpacked everything from the move, I cleaned the ice cream machine up and stuck the bowl in the freezer. I went hunting around to see what recipes I could find and figure out if we could come up with something. We turned Chocolate Malt Ice Cream into a more soymilk based version rather than using cow's milk - but it does have some dry milk in it. Chocolate is used in two ways here; we used chocolate malted-milk powder (Carnation brand) and chopped unsweetened chocolate from Ghiradelli. The base is heated on the stove until it starts to simmer and the chocolate can meld into the liquids. We were looking for a lighter option, so egg whites instead of whole eggs are used which does make it a little less rich. The whites are slowly brought up to temperature by whisking the hot milk mixture in a slow stream so they don't scramble. To get the best finished consistancy, be sure to refrigerate this mixture overnight - if you can't wait that long though, do at least 3-4 hours. We were surprised how much we enjoyed the texture of this - the first day it was smooth, creamy and very chocolately with a malt background. The second day it was a little more icy, but still very good. Jeff commented that it was still rich for being light and the flavor was very remenicient of fudge. Jeff always told me in the past that he does not like cornbread - but every so often when I make it, he seems to now ask why we never have it! Hmph! 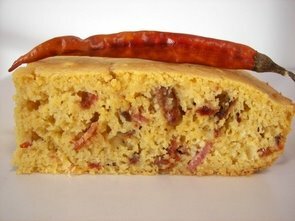 Chipotle-Bacon Cornbread has a hint of sweetness, but what dominates the bread is a surprising smoky heat. Cumin and chipotle chiles pack these flavors, but is kept in check from the tang in the buttermilk. A good amount of crisp salty bacon adds a textural difference and brings its own depth of a smoky flavor. This is definitely a more moist, rather than dry and crumbly, cornbread. I could see bringing this to a summery barbecue picnic or having this as a side to a warm bowl of chili in the cool fall. 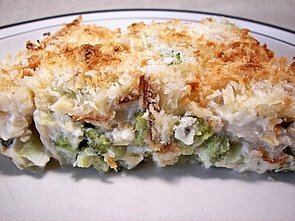 It may not be casserole weather, but I have been wanting to try this recipe, Zesty Broccoli Casserole, since we are big fans of broccoli. I used fresh steamed broccoli, as there are always a few crowns in the refrigerator, but it would be easier to use the frozen. When Jeff walked through the kitchen, he asked why there was naked broccoli sitting in a large baking dish... then he walked over and saw the cheesy sauce I was making on the stove and told me to hurry up! I used plain soymilk for the base of the sauce, but you can use milk. Once thick, two cheeses are melted in along with sour cream and plain yogurt to create a silky smooth texture. Sliced water chestnuts are added to bring a fun and unexpected crunch to the sauce. After the naked broccoli is drenched in sauce, a melted butter and panko combination is scattered on top. The casserole is then popped in the oven and baked until bubbly and the panko turns an appealing crunchy golden brown. We both really liked this, but be prepared for lots of different textures!